BRYAN EATON/Staff photo. 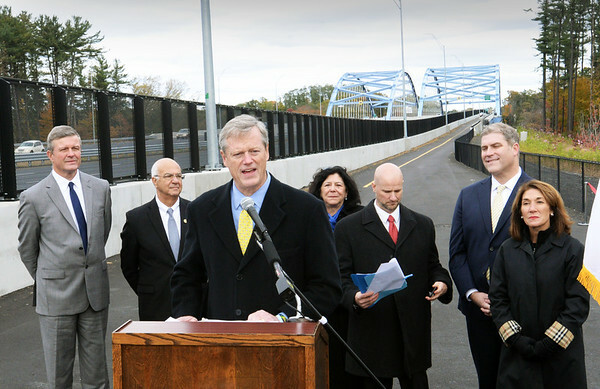 Governor Charlie Baker speaks at the dedication of the Garrison Shared Use Path and the rededication of the Whittier Bridge. Behind is, from left, Salisbury Town Manager Neil Harrington, Amesbury Mayor Ken Gray, Newburyport Mayor Donna Holaday, Jonathan Gulliver, highway administrator the Mass. DOT, state Rep. James Kelcourse and Lt. Governor Karyn Polito.